As the cold breeze sweeps in, raking away the last lingering memories of summer, we’re falling back into an old familiar season. But autumn is more than just a flavored latte wrapped up in a comfy sweater! Just like those beautiful (and pesky) leaves of all colors, the feeling of fall time seems to find its way into everything we do over the next few months. As summer slips away, each year we’re confronted with powerful reminders of the cyclical nature of things; trees change colors, plants wither away and temperatures drop ever lower, even when we may not want them to. These moments are not necessarily good or bad, but they do represent one unavoidable aspect of life – change. Not unlike the seasons, your career will constantly be changing and evolving. Some changes may be expected and happen smoothly, others are less predictable and may even be uncomfortable. However, as one job recedes into memory, a new position gradually shows its colors. Transformation takes time, so enjoy the opportunities a change can provide and embrace this process. If you’ve ever left for the day in darkness, only to return home in even more darkness, you know this seasonal change all too well. The sunshine appears later and later each morning, and leaves sooner and sooner with each passing evening. Fall tends to make everyone a bit sleepier- apparently even Mr. Sun! Searching for a new career is a full-time job that can require some strange hours. Between all of the complicated online application forms, resume updates, self-improvement and educational opportunities, interview appointments and other tasks you may take on during your search, it can be easy to become overwhelmed. Remember the lesson of Mr. Sun – there are only so many hours in the day! Keep yourself organized and build in time to refresh and recharge your body and mind. Thousands of students, teachers, faculty members and families alike embrace the traditions of homecoming during the autumn months. Loyal graduates travel from all over the world to reconnect and share memories of their time at their school, college or university of choice. Aside from the tailgating and the touchdowns, homecoming events are a great reminder to stay in touch with the people and places that have positively impacted your life; after all, their cheers and leadership have influenced your journey up to this point. Your educational background will be an important piece of your application materials, and so are the good words of those in your professional network. Take some time to reestablish these connections; you never know when you’ll be asked to return the favor too! As the fall breeze cools off summer’s shine, it can be easy to let the gloom affect your job search. By embracing the change, organizing your time wisely and reconnecting with important people and places in your life, you can power through the season. 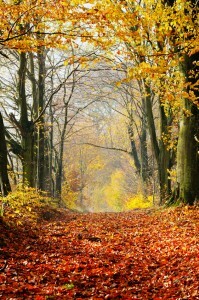 Do you have any tips for handling this seasonal change? Share them below! This entry was posted in Job Seekers and tagged Autumn, career change, change, fresh start, homecoming, job search tips, Networking Tips, organizational skills, time management. Bookmark the permalink.